Grade reports will be posted on Monday, April 16, 2018 at 5:00 p.m. To view your child's grade report, please follow the instructions below. 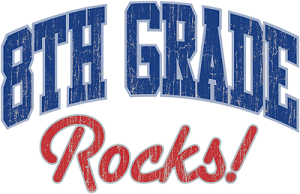 If you have a question regarding a grade or comment, please email the teacher using Skyward. 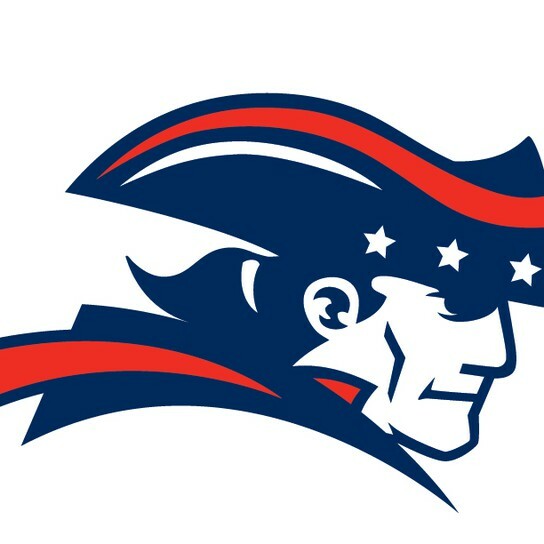 If you do not have your Skyward Login information, call the Main Office @ 414-329-6600 for assistance. 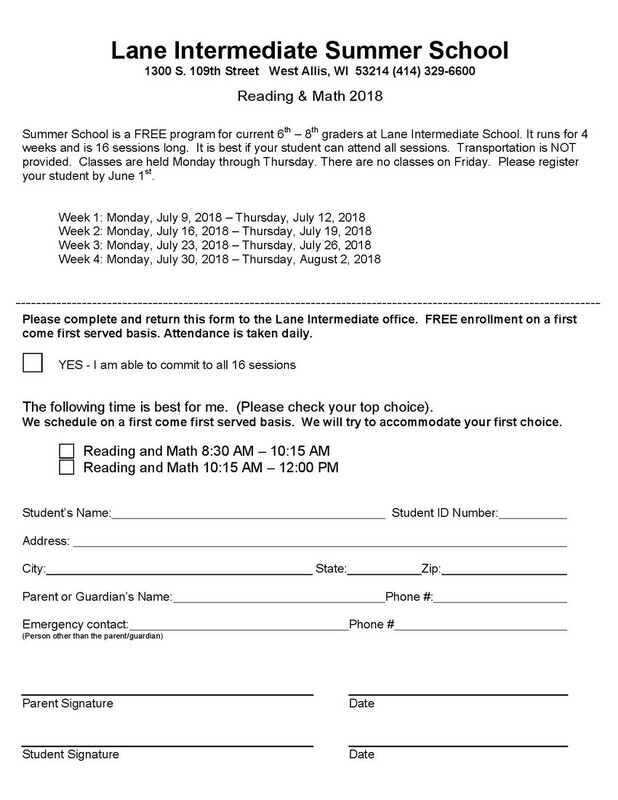 Paper copies are available by request through the Main Office. April 18 -- Lane Family Dine Out Night - MOD pizza New Berlin location Wednesday, April 18th open to close show below flyer so we can earn 20%!! Let's celebrate YOU and your classmates! Forward any pictures to pogodzinskil@wawmsd.org or print and hand in to me in the main office, that you'd like to be included on the "Memory LANE" bulletin board outside the main office. Please remember these should be school appropriate and photos taken at school events (dances, games, field trips, concerts etc) and should include you and your 8th grade friends...send some cute 6th and 7th grade pics before you all hit your "growth spurt" too. 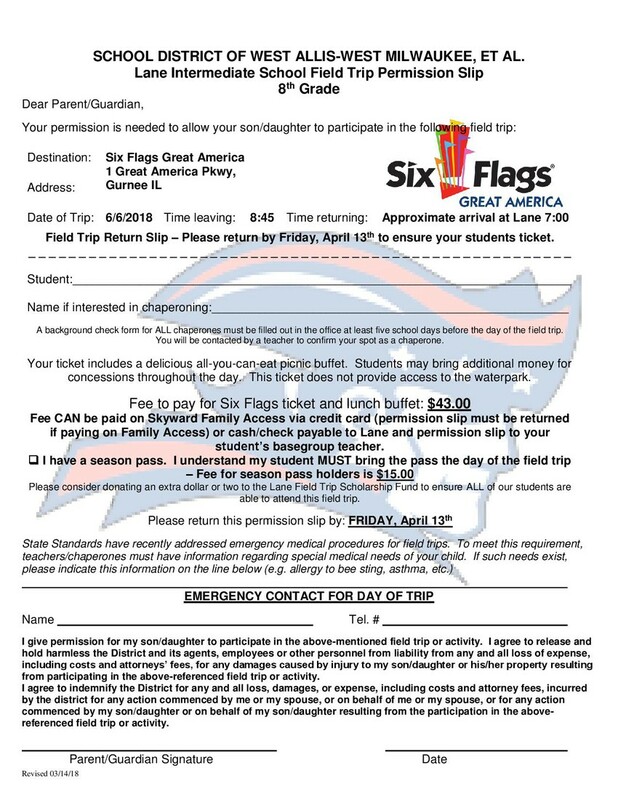 Please take note that each 8th Grade Student receives 4 tickets (graduates do not need a ticket). Ticket restrictions allows us to accommodate all 185 8th Grade Students and to abide by fire code and gym capacity. Thanks for understanding! Fee to pay for ticket and lunch buffet is $43.00. The ticket includes a delicious all-you-can-eat picnic buffet. Still looking for people to fill all our board positions! 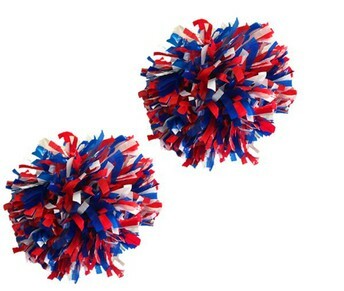 We have a nominations for 1st Vice President - Beth Myers, Secretary - Carrie Zagzebski, and Treasurer - Cheryl Ramos. There is no nomination as of yet for President please consider stepping up to help plan fun events and activities for our Lane Scholars! 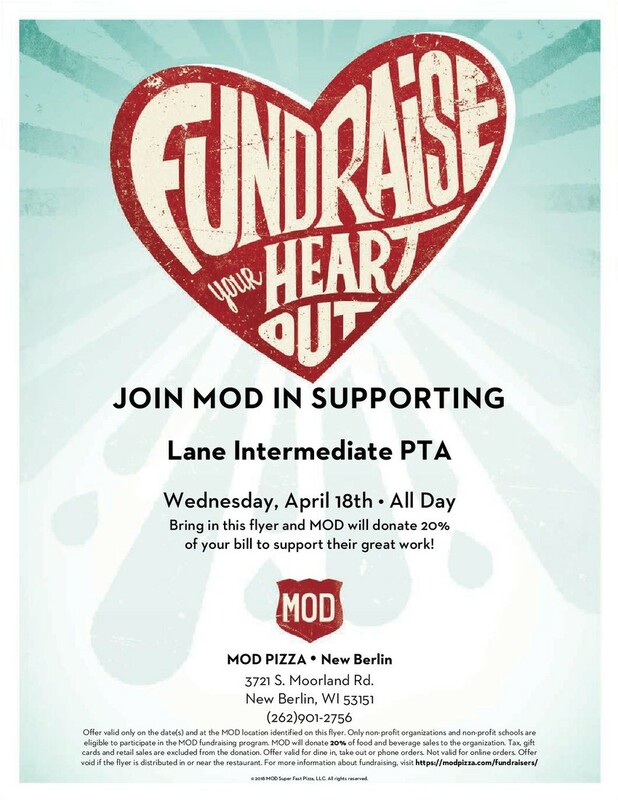 Lane Family Dine Out Night - MOD pizza New Berlin location Wednesday, April 18th open to close show flyer so we can earn 20%!! 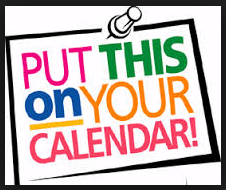 May 15th Last PTA meeting and elections for 2018-2019 board and budget proposal!! If you would like to run for any board position or have ideas for 2018-2019 school year please attend the April 17th meeting and/or contact laneintermediatepta@gmail.com. 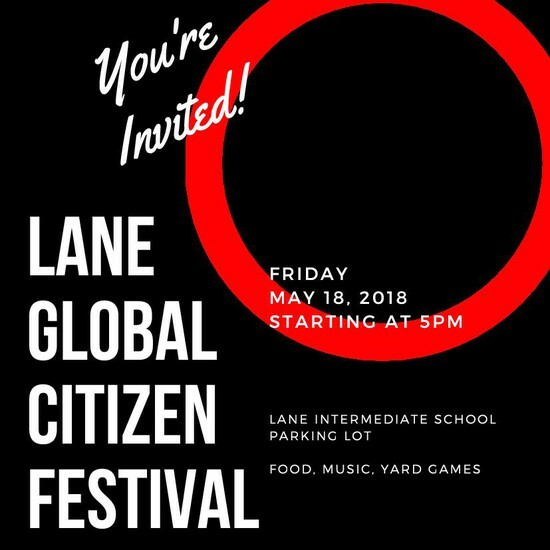 Date of Event: Friday, May 18, 2018 1 to 3pm. Ethnic food samples are permissible and will be labeled with ingredients. Any cultural artifacts, food, displays, flags, music, art, posters, dance, educational information, cultural dress, and the like would be so welcome. Tables will be set up in our auxiliary gym with the cultural representatives housing a table. Students will be able to walk through the gym and stop and talk to the representatives, sample food, play games, and ask questions and learn. Lane has approximately 530 students total in grades 6,7, 8. 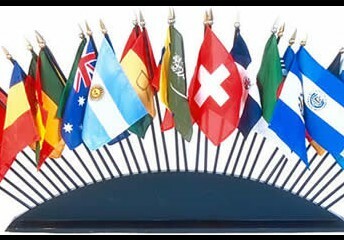 The theme of Lane's Multicultural Fair is WE ARE ONE WORLD. Would you please participate? Please call or email me. We want to make this a wonderful event for our students as they grow and learn about culture. Thank you in advance. 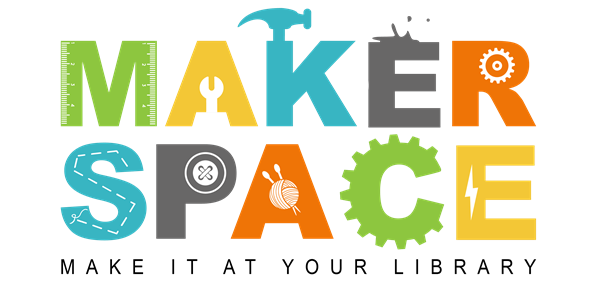 The Lane Makerspace is looking for household items that may no longer be working or needed from your home. 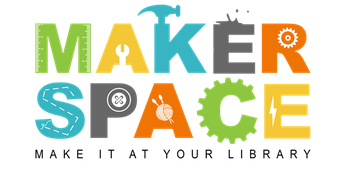 Ideas might include marbles, puzzles, dominos, desktop computers, answering machines, craft items like glue guns or paints as well. We are attempting to build simple machines without batteries or electricity. If you have any questions, please email Mrs. Smith, smitj@wawmsd.org. Have you ever wanted to learn to play an instrument? Piano, Guitar, Percussion (Drums)? Or any other Band Instrument? Do you already play and wish to learn more? This summer private music lessons are offered through the WAWM Recreation Department. Success in school and outside goes beyond academics. A major part of the success of student is being an active participant in the events that take place and create an opportunity for school and community pride! 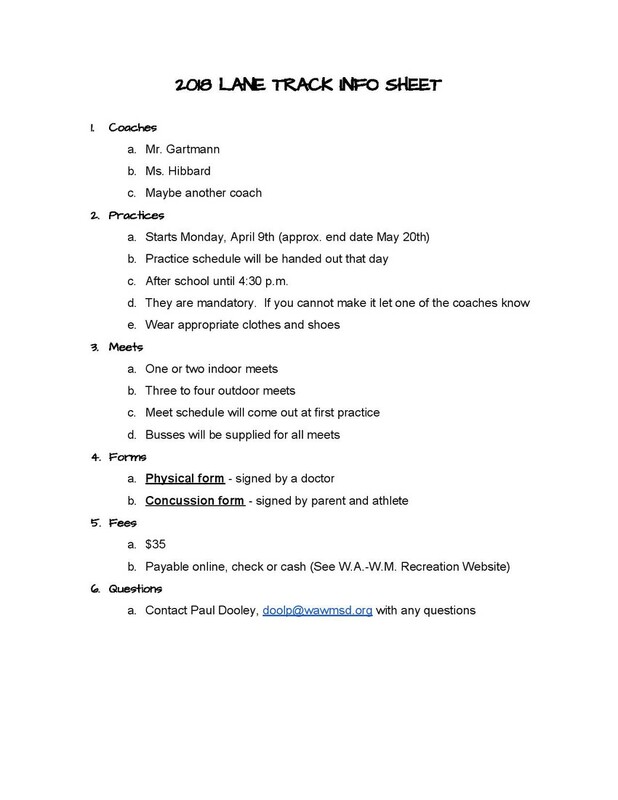 Below is a list of the sports and clubs that are being offered at Lane Intermediate this fall - please look for updates and have your student(s) look for times to sign up! Times and dates for the following will be shared through the community message as well as by the staff leading the opportunities. Lane Star Store - Meets 1 to 2 times per month during base group. Students learn how to purchase, advertise, and sell items at our Lane Bookstore. Funky pens, erasers, notebooks, fidget toys, bouncy balls, scented markers, and more are sold during all three lunch hours on Wednesdays. Students run the store and check out student purchases on Wednesdays. Lane Start Store Mission: Putting smiles on faces and donating profits to charities. SkillsUSA - SkillsUSA is a professional organization that encourages students development of personal, workplace and technical skills grounded in academics. Being a part of SkillsUSA will allow students the opportunity to get involved in the community and be connected with professionals in their field of interest. This is new to Lane this year and our middle school students, yet is established at the high school level. Anyone is welcome to join and some will be asked due to teacher recommendations. limit 10 students and it is run by Mrs. Ustruck. See her for details. Please complete below Lane's Mid-Year Feedback Survey! 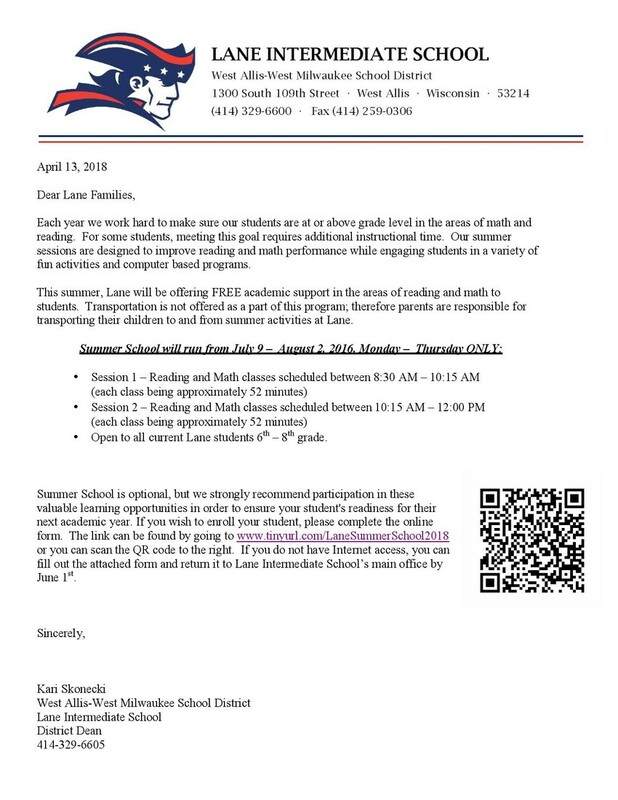 The Lane Building Leadership Team is asking our families to please provide us with feedback around something that is working well and/or a positive experience AND an opportunity for us to improve before the end of this current school year.